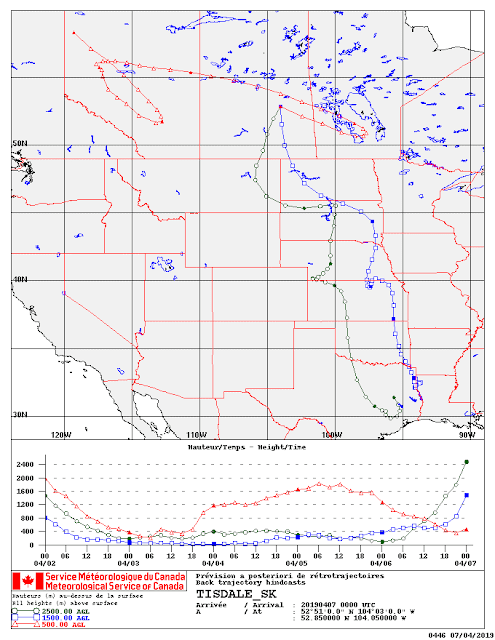 This week we share the prairie-wide risk maps to prepare for the 2019 growing season and we continue to evolve how the wind trajectory data is available. Questions or problems accessing the contents of this Weekly Update? Please e-mail either Dr. Meghan Vankosky or Jennifer Otani. Past “Weekly Updates” can be accessed on our Weekly Update page. Subscribe to the Blog by following these three steps! Agriculture and Agri-Food Canada (AAFC) and Environment and Climate Change Canada (ECCC) have been working together to study the potential of trajectories for monitoring insect movements since the late 1990s. DAILY REPORTS, as they can be generated, will be put up as a downloadable PDF file on this page. WEEKLY REPORTS will be included within the Weekly Update and can be retrieved by clicking this hyperlink. 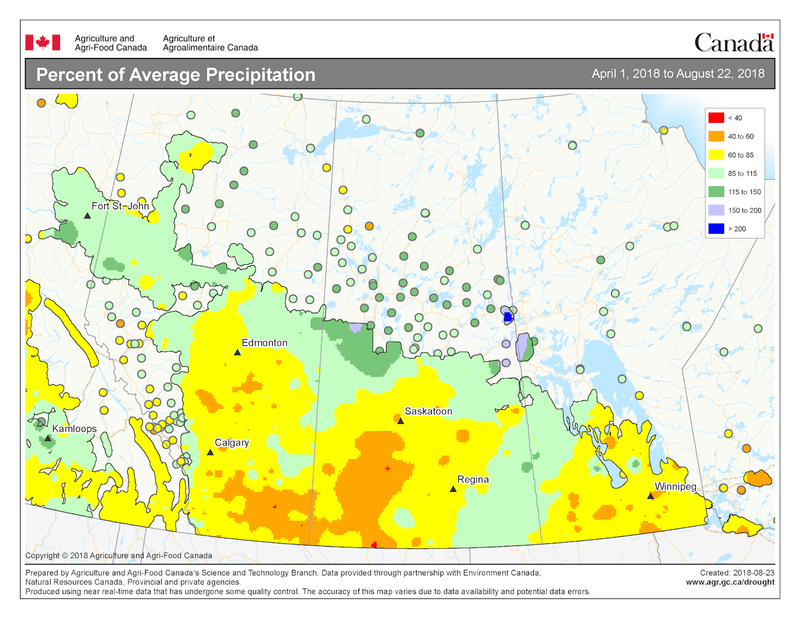 The 2019 Prairie-Wide Risk and Forecast Maps can be viewed and downloaded here. Economically significant insect pests are monitored across the Canadian prairies each year, thanks to extensive networks of collaborators and cooperators. In 2018, that effort culminated in 5764 survey stops across Manitoba, Saskatchewan, Alberta and the BC Peace! Average tempature, average precipitation, and modeled soil moisture for 2018. A series of geospatial maps are included for each of the target species; the current map is followed by the previous 4 years. For some species, the geospatial maps represent 2018 distributions used to infer risk in the coming 2019 growing season. Data is included for bertha armyworm, cabbage seedpod weevil, pea leaf weevil, wheat stem sawfly and diamondback moth. For wheat midge and grasshoppers, the geospatial maps forecast or predict expected populations or risk for the 2019 growing season. 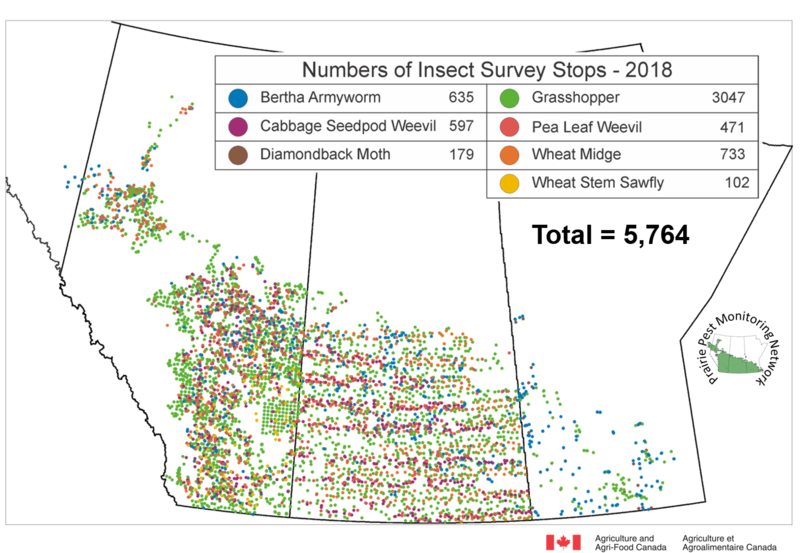 These maps help the agricultural industry prepare to manage insect pests across the prairies and helps growers make crop choices and anticipate scouting priorities within their growing region. From May to July, the Weekly Updates will provide in-season updates, predictive model outputs plus scouting tips and links to relevant information. Thank you to the many people who monitor each growing season! In 2018, swede midge pheromone traps were deployed at 41 sites across the Prairie region of Canada to monitor adult populations of this brassica pest. 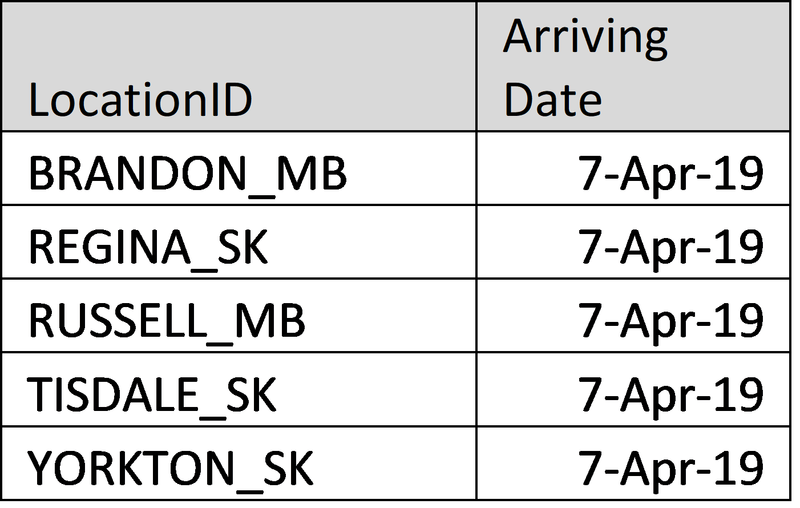 Of the 41 trap sites, 16 were located in Alberta, 19 in Saskatchewan (where positive swede midge identifications were made in 2007 and 2009), and 6 in Manitoba. 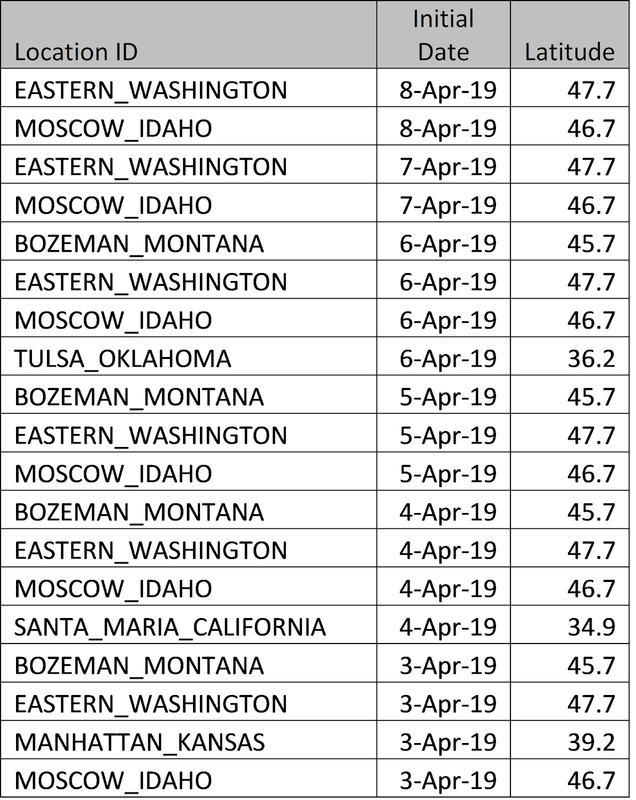 None of the traps were positive for swede midge in 2018. We are grateful to all of the producers, agronomists, and cooperators who participated in the 2018 swede midge monitoring project. Without your assistance, we could not have supported such a thorough and widespread pheromone monitoring program. We also extend our thanks to Jonathon Williams for organizing the program, distributing trapping materials, and processing returned sticky cards for adult swede midge. Because of the serious threat that swede midge poses to canola production, it is vital that monitoring for swede midge continues across the Prairies. At this time, plans are being made for the 2019 swede midge monitoring program. We hope that we can count on your support and cooperation in 2019. At this time, plans are being made for the 2018 swede midge monitoring program. Agrologists or growers interested in performing weekly monitoring in 2018 are encouraged to contact Jonathon Williams, Boyd Mori, or Meghan Vankosky for more information. • Referring to the Canola Watch article by Dr. Julie Soroka or accessing a new Ontario fact sheet produced by Baute et al. 2016. • Accessing the swede midge pages within the new Field Guide which is available as a free download in either English or French. We're back for the 2019 growing season! 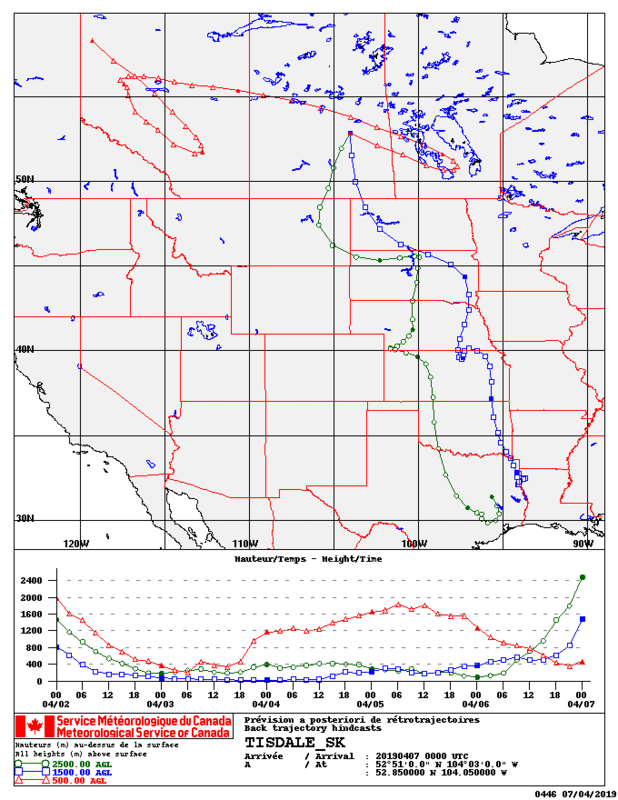 April's information will focus on wind trajectories related to the prairie provinces. This is an important tool used to track potential arrival events for pest species moving northerly into the Canadian prairies from more southerly points of origin (e.g., diamondback moth, aster leafhoppers). This is the last Weekly Update of the 2018 growing season. 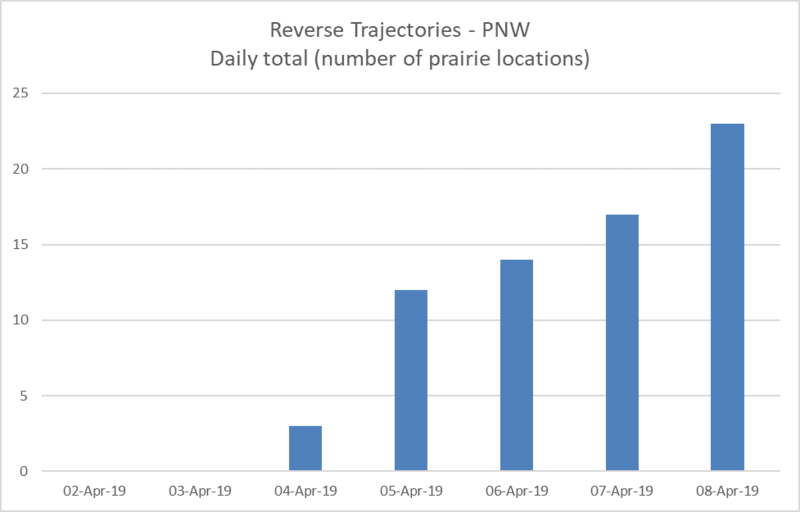 It is the 16th week of both the INSECT OF THE WEEK plus WEEKLY UPDATE - hopefully each has supported in-field scouting in our prairie field crops! Thank you to our many contributors and sincere appreciation is extended to the many people who repeatedly visited fields all season to support provincial AND prairie-wide insect pest monitoring in field crops in 2018! Access the complete Weekly Update either as a series of Posts for Week 16 (August 23, 2018) OR a downloadable PDF version. Also review the "Insect of the Week" for Week 16! 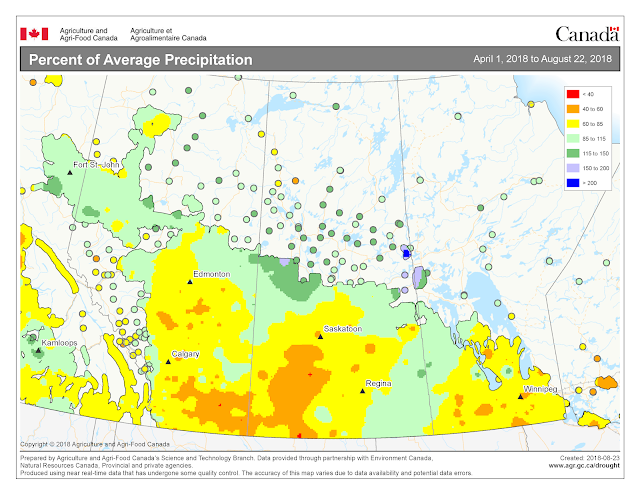 Weather synopsis – We close out the Weekly Update for the growing season by looking back at precipitation thanks to the AAFC Drought Watch folks. Figure 2. 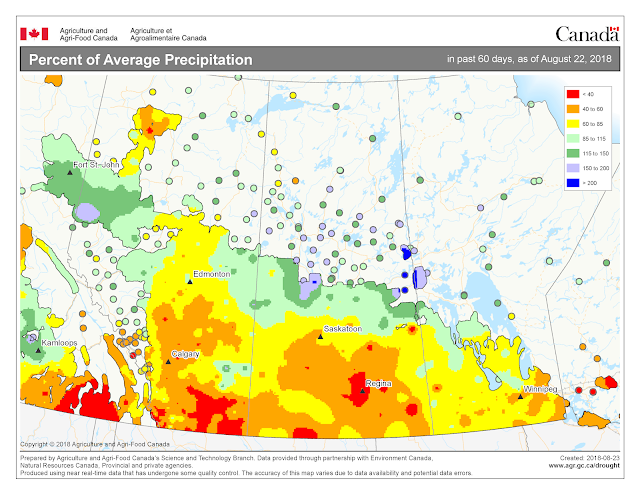 Percent of normal precipitation the past 60 days (as of August 22, 2018) across the Canadian prairies. Figure 3. 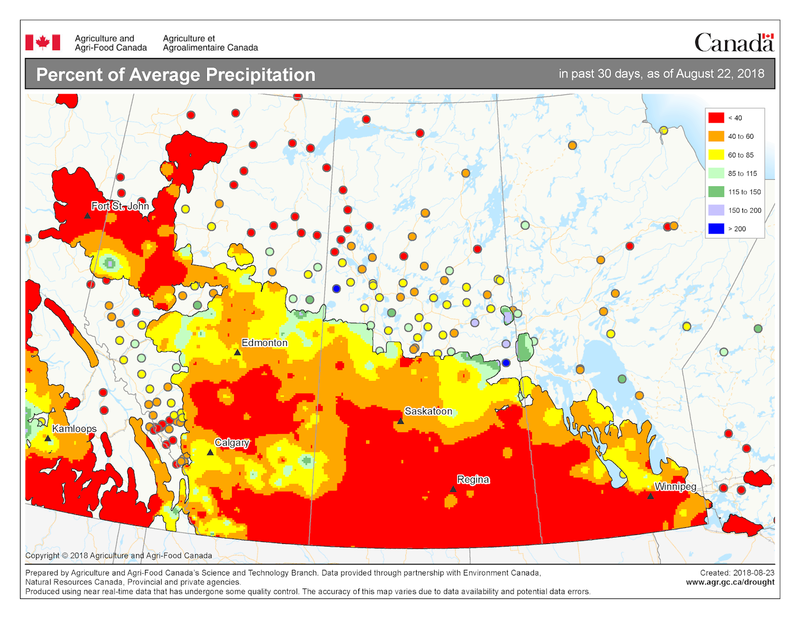 Percent of normal precipitation the past 30 days (as of August 22, 2018) across the Canadian prairies. 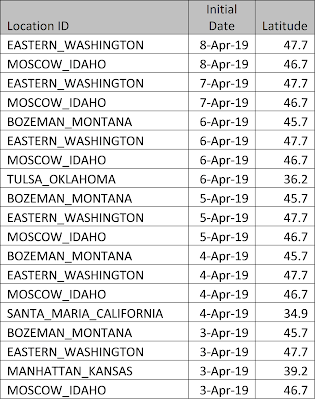 Here is the accumulated precipitation the past 7 days (Fig. 4)! Figure 4. 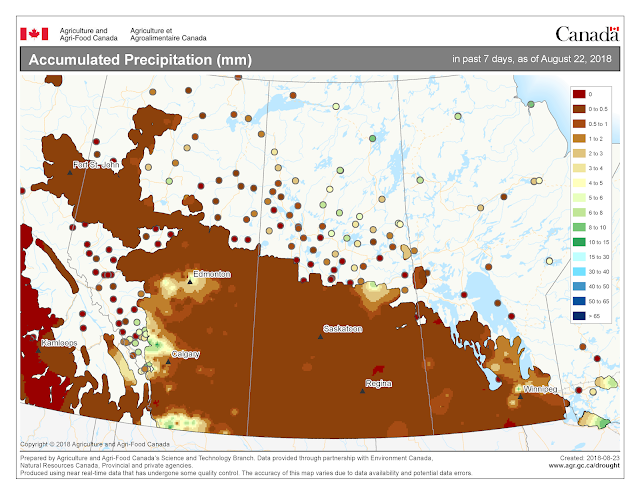 Accumulated precipitation the past 7 days (as of August 22, 2018) across the Canadian prairies. 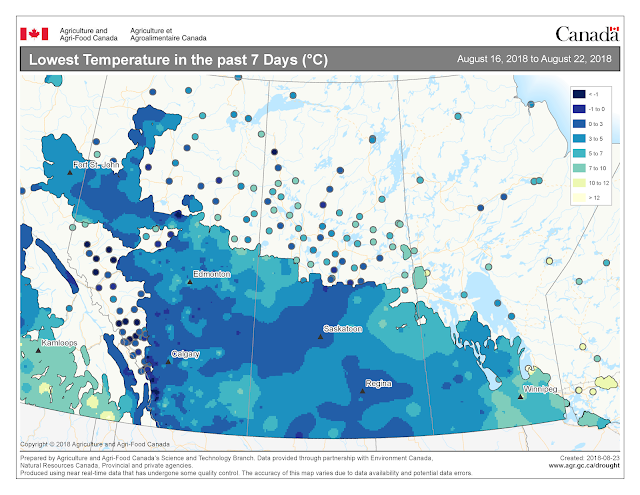 The map below reflects the Highest Temperatures occurring over the past 7 days (August 16-22, 2018) across the prairies and is available from Agriculture and Agri-Food Canada (Fig. 5). 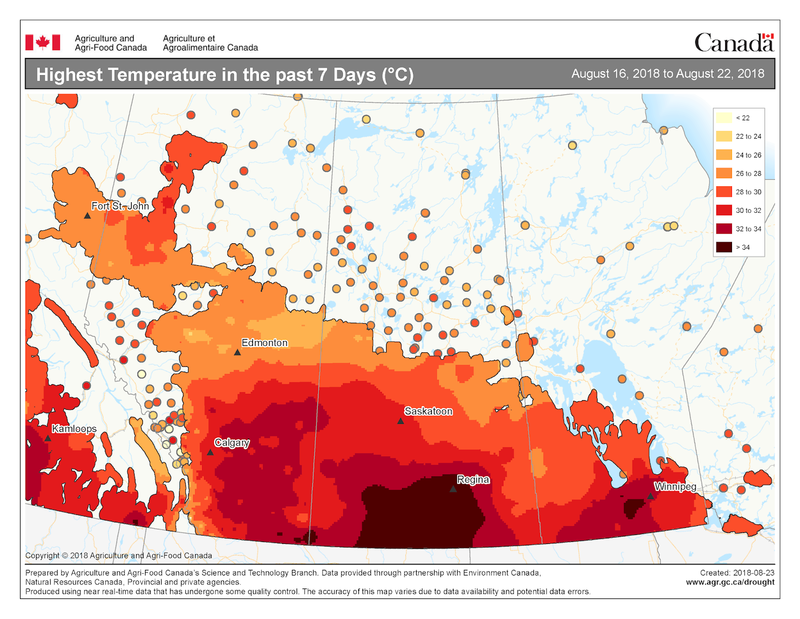 The map below reflects the Highest Temperatures occurring over the past 7 days (August 16-22, 2018) across the prairies and is available from Agriculture and Agri-Food Canada (Fig. 6). The maps above are all produced by Agriculture and Agri-Food Canada. Growers can bookmark the AAFC Drought Watch Maps to continue to follow weather conditions during harvest and beyond. Reminder - Pre-Harvest Interval (PHI) - Growers with late-season insect pest problems must factor in the PHI which is the minimum number of days between a pesticide application and swathing or straight combining of a crop. The PHI recommends sufficient time for a pesticide to break down and a PHI-value is both crop- and pesticide-specific. Adhering to the PHI is important for a number of health-related reasons but also because Canada’s export customers strictly regulate and test for the presence of trace residues of pesticides. An excellent summary of PHI for various pesticides in their various crops was posted by Saskatchewan Agriculture's Danielle Stephens in 2016 within their Crop Production News. In 2013, the Canola Council of Canada created and circulated their “Spray to Swath Interval Calculator” to help canola growers accurately estimate their PHI. Other PHI are described in your provincial crop protection guides and remember that specific crop x pesticide combinations will mean different PHIs. Finally, work towards "Keeping It Clean" so your grain is ready for export! More information about PHI and Maximum Residue Limits (MRL) is available on the Keeping It Clean site. Earlier this month, feeding channels on the upper surfaces of the flag leaf in wheat were reported and evening scouting revealed this culprit! Crooked Creek AB (August 2, 2018; det. Lien Luong). Figure 2. 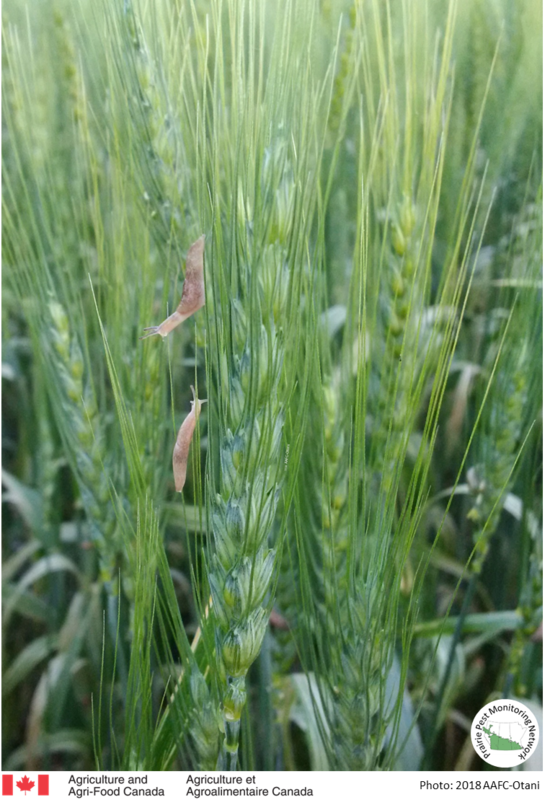 Flag leaf feeding damage on wheat caused by the grey field slug (Deroceras reticulatum). Photo taken near Crooked Creek AB on August 2, 2018, by J. Otani. Field scouting was performed in the evening from 8:30-10:30pm. 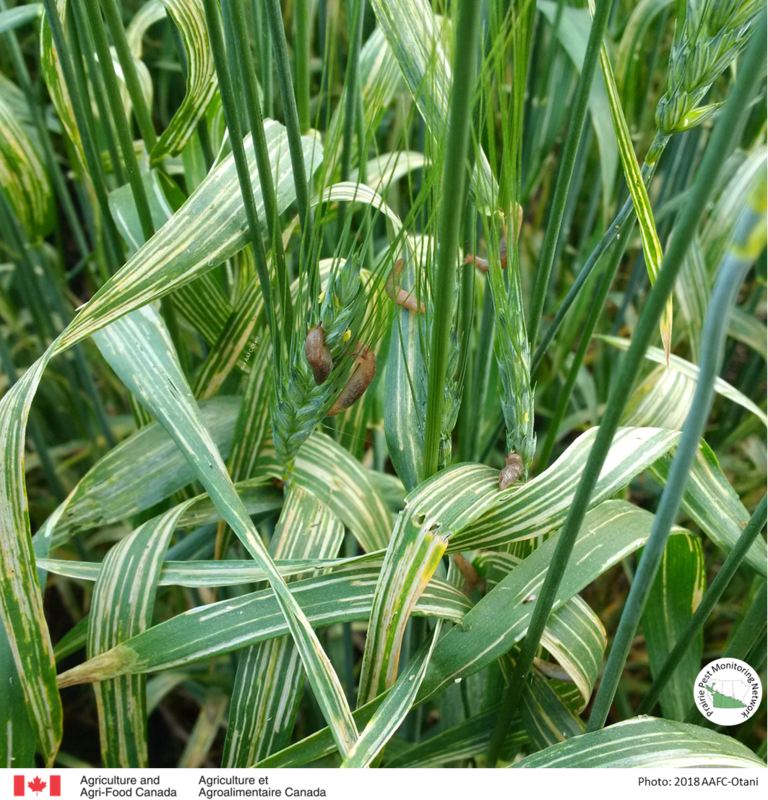 As the temperatures decreased, the slugs moved up the wheat stems, climbing to the topside of the flag leaf and onto the wheat heads although they did not appear to feed at the developing kernels. Wheat was hand-collected by clipping stems ~20cm above the ground to later reveal a density of 1.04 slugs per stem (n=465 stems) causing the above damage (Fig. 2). Specimens were forwarded to L. Luong (U of A) who identified the slugs from the above field as one species, Deroceras reticulatum, the grey field slug. The majority were juveniles. The grey field slug is the most common to occur in the home garden. Slugs are a complicated problem because most general insecticides don’t work well on them. Sluggo Professional (PCP#30025) is registered for slugs in field crops. It is a bait, which must be consumed by the slugs to be effective but it could be expensive on a large field. Often insecticides don't work well on slugs and it may be related to the mucous coating slugs exude. Be wary, if an insecticide is applied, the product will likely not affect the slugs but it will kill the ground beetles and other natural enemies that prey upon or parasitize slugs and could exacerbate the slug problem. Growers using no-till or minimum till operations may consider tillage to help reduce future levels of slugs. Health Canada has an overview of snails relating to gardening posted here. Bugs of the Family Miridae are also referred to by their common name, "plant bugs". 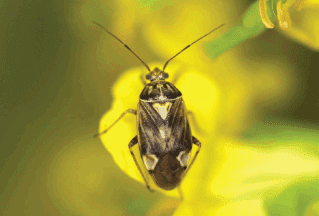 Prairie growers are familiar with two plant bugs - lygus and alfalfa plant bugs. Plant bugs are a very large group of bugs that can include herbivores, omnivores and predators but virtually all are polyphagous which is a term referring to their ability to feed on several species, even Families of other organisms. Plant bugs are generally very mobile as both adults and nymphs and move readily to feed on different host plants as the season progresses. 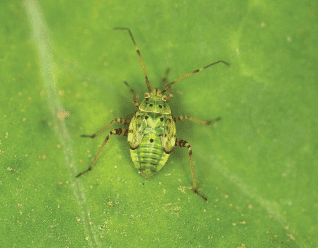 Plant bugs can also have different lifecycles with alfalfa plant bugs reproducing as one generation per year whereas lygus bugs can have two to three generations per year. This season in southern Alberta, first-generation lygus bugs damaged seed alfalfa in June then the second generation damaged canola fields in July and August. High numbers of lygus bugs (10-20 per sweep and higher) were collected in research and demonstration plots of sainfoin, hemp and quinoa in southern Alberta. Both lygus and alfalfa plant bugs have sucking mouthparts and the larger, more mature nymphs plus adults are able to penetrate and extract oils from seeds, causing them to shrivel and lose in quality. Plant bugs feeding in faba beans can cause spotting. Wasps in the genus Peristenus include native species that attack lygus and alfalfa plant bugs but normally don't occur in sufficient densities to reduce outbreaking populations of these plant bugs. The exotic Peristenus digoneutis from Europe, if it could be established and is shown not to interfere with native predators and parasitoids, may increase parasitism to help prevent plant bug outbreaks. Adult L. lineolaris (5-6 mm long) (photo: AAFC-Saskatoon). Fifth instar lygus bug nymph (3-4 mm long) (photo: AAFC-Saskatoon). The Canadian Grain Commission is ready to grade grain samples harvested in 2018. Samples are accepted up to November but send samples as soon a harvest is complete. This is a FREE opportunity for growers to gain unofficial insight into the quality of their grain and to obtain valuable dockage information and details associated with damage or quality issues. The data collected also helps Canada market its grain to the world! More information on the Harvest Sample Program is available at the Canadian Grain Commission’s website where growers can register online to receive a kit to submit their grain. NEW for 2018-19: Participants will receive Falling Number and deoxynivalenol (DON) results for their wheat samples at no cost. This enhancement to the Harvest Sample Program is the first initiative to be funded by the Canadian Grain Commission’s accumulated surplus. Many producers find having both grade and quality information on their samples before delivering their grain to be helpful. 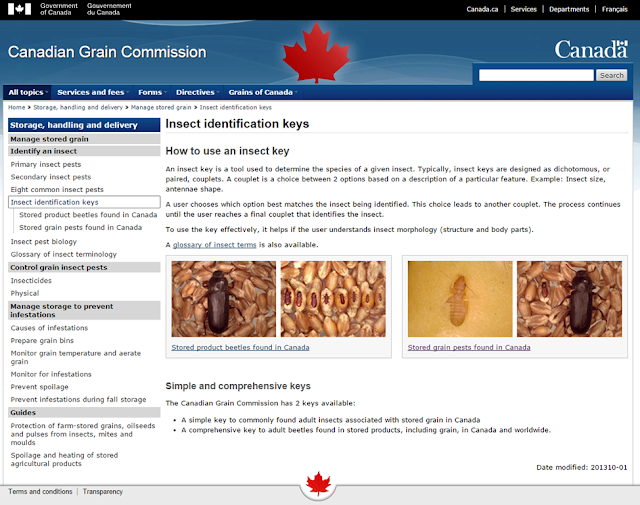 The Canadian Grain Commission's website has an online key to stored product pests. Growers managing grain storage can find an online identification tool for stored product pests (e.g., Rusty grain beetle, Red flour beetle, Confused flour beetle, Saw-toothed grain beetle, and more). The online tool features excellent diagnostic photos. A screen shot of the webpage is included below for reference. Manitoba's Insect and Disease Updates for 2018 can be accessed here. Issue #13 (posted August 22, 2018). Saskatchewan's Crop Production News for 2018 is posted with Issue #7 now available. This issue includes an update from the Crop Protection Lab. Alberta Agriculture and Forestry's Call of the Land regularly includes insect pest updates from Scott Meers. 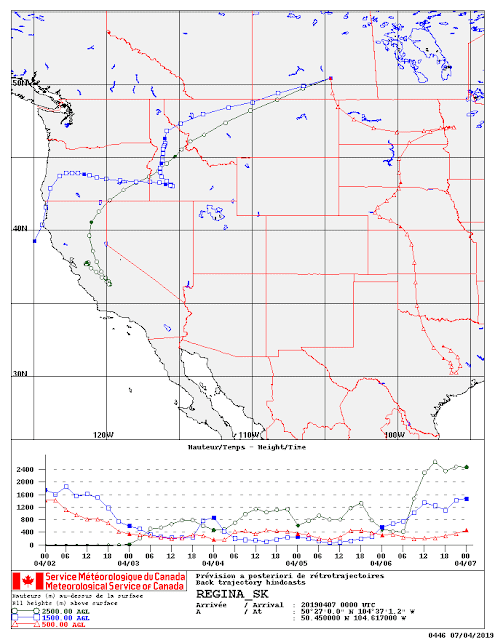 The most recent Call of the Land was posted August 23, 2018. • The United States Department of Agriculture (USDA) produces a Crop Progress Report (view the August 20, 2018 edition). • The USDA's Weekly Weather and Crop Bulletin (view the August 21, 2018 edition). Review the 2018 INSECT OF THE WEEK! Review the WEEKLY UPDATE for 2018 growing season! • September 27-29, 2018: The Entomological Society of Alberta Annual Meeting will be held at Edmonton AB and information is available here. 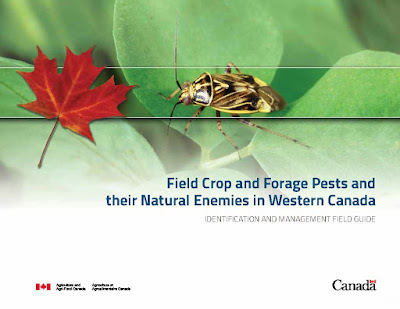 • October 18, 2018: The Western Committee on Crop Pests will meet at Lloydminster SK and information is available here. • October 23-25, 2018: The 11th Canadian Pulse Research Workshop will be held at Edmonton. More information is available here. • October 23-25, 2018: The 2018 Canola Discovery Forum will be held at Banff AB. More information is available here. • November 11-14, 2018: The Joint Annual Meeting of the Entomological Society of Canada, Entomological Society of America and Entomological Society of British Columbia meets at Vancouver BCand information is available here. • January 29-31, 2019: FarmTech 2019 will be held in Edmonton AB and information is available at http://farmtechconference.com/ with registration typically opening early in November. Please send other IPM-related conference and meetings to jennifer.otani@canada.ca to update this information.